Arrive in Xian in the morning. Be met by tour guide at the arrival hall of Xian airport and transferred to hotel. After lunch, have city tour to Shaanxi History Museum, a first-rate national museum in China, and Ancient City Wall where you can stroll or cycle (extra cost) on the top for panorama of the city. Enjoy the gorgeous Tang Dynasty Music and Dance Show in the evening. Today you are able to see face to face the Terracotta Warriors and Horses, the “life-size underground army” which has guarded the tomb of the first Chinese emperor for more than 2,000 years. Besides, vist the Bell Tower, the emblem of Xian city, and the Big Wild Goose Pagoda, one of the grandest Buddhist buildings in China. Fly to Shanghai after the tour. 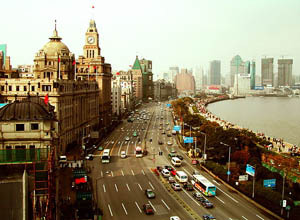 Upon arrival, airport to hotel transfer in Shanghai. One full day exploration in this world famous international metropolis. We will visit the highlights sites in Shanghai, including the Bund, the former foreign settlement where lies imposing buildings of different foreign styles; Nanjing Road, famed as the first commercial street in China; Yu Garden, a beautiful private garden of a Chinese official in the Ming Dynasty; Yu Market, where sells interesting local things; Jade Buddha Temple, famous for the two big jade Buddha statues imported from Burma; Oriental Pearl TV Tower, one of the tallest buildings in the world, standing 468 m high by the Huangpu River. Free at leisure until being transferred to the airport for the flight to your next destination. *Entry Xian and exit Shanghai flights.